Kidville Bethesda offers award-winning gym, art, dance, music, and preschool classes for kids. Our classes and birthday parties help kids learn, play, and grow. Browse our salon hours and services. Book an appointment online. News on Winter Closures and Delays! Kidville Bethesda follows MCPS Administrative Office decisions for delays and closures! Emails are sent out to all members as soon as we have new information, therefore, always be on email alert if you have any issues or questions regarding whether we are closed or delayed during the winter. Should a 2-hour delay occur, any classes or haircuts that begin before 10am are cancelled (haircuts are rescheduled and a make-up is given for classes), and classes starting at 10am and onward would run as planned. KVU Might be Perfect for your Little one! Kidville University (KVU) is a social pre-school alternative program offering children a positive first school experience. Teachers serve as guides for parents and children during a gradual separation process tailored to each family. It's perfect for those who aren't quite ready to head off to school and want more than our 45 minute classes offer! Call us at 301-656-5030 for more info! Introducing our new Kidville Playgroup For Moms (And Kids)! Kidville Playgroup is an opportunity for moms to meet and socialize with other moms while their kids enjoy a variety of Kidville classes. This 90 minute session will take place once a week and will include 1 - 45 minute Mommy and Me Kidville class plus 45 minutes for moms to socialize while kids explore in an open play format (in our Wiggle Room) with developmental & sensory toys. 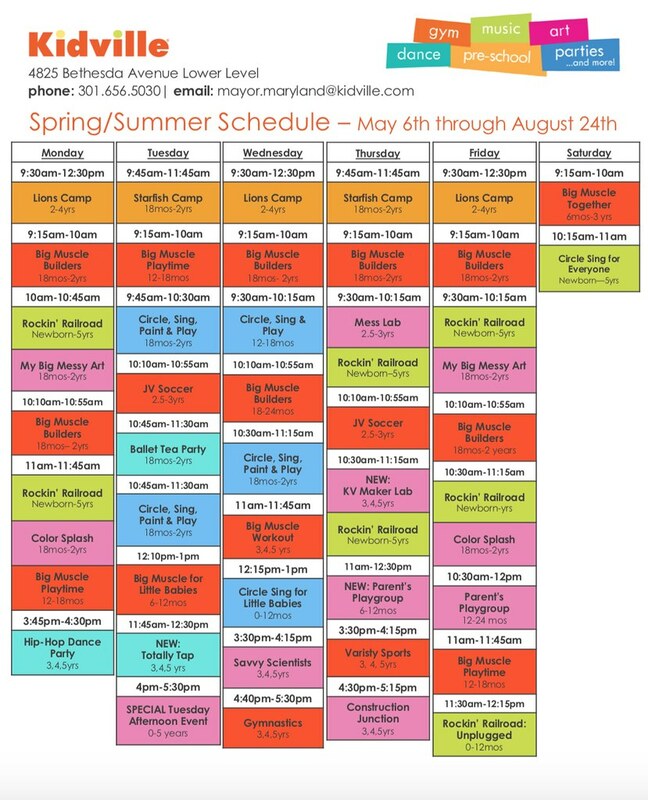 We will mix up the classes so that kids and moms can preview all that Kidville has to offer including our Rockin Railroad music class, Circle Sing and Play enrichment class, and Big Muscle Playtime gym class. This is the perfect opportunity for moms to meet and forge friendships with other moms while their kids enjoy all that Kidville has to offer! Limited spots available, sign up today for an 8-week session for just $250! Enroll For WINTER 2019 Classes! Enroll now for the Winter 2019 semester! Schedule has just gone live! 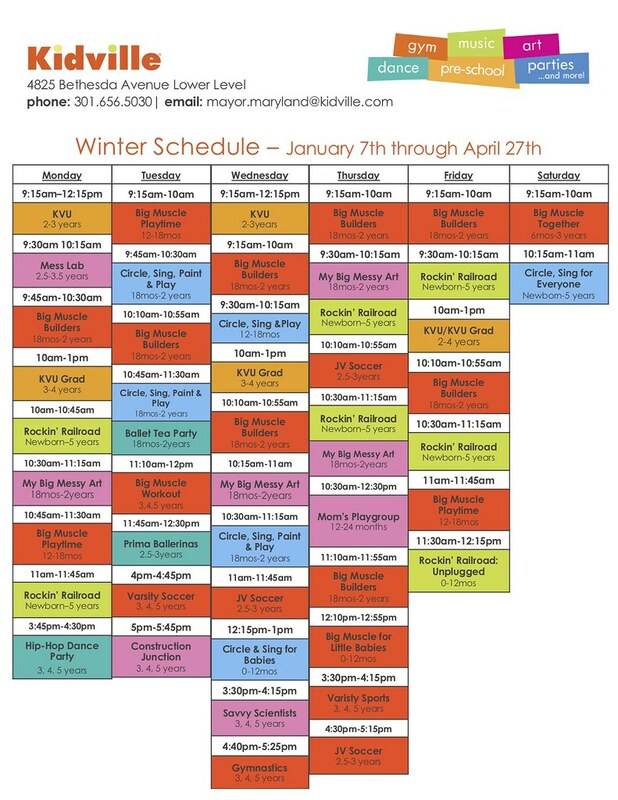 Classes run from January 7th through April 27th! Call us today at 301-656-5030 or purchase online to secure your spot in your favorite Kidville class!